She sits next to an Irish harp, a cap of Liberty on a pole, and bales marked "Irish Manufactory", "For France", "For Spain" and "For America". The Liverpool-trained printer John Robinson moved to Staffordshire as did the other Liverpool printers Thomas Rothwell, Henry Baker and Thomas Fletcher. This engraved plate was signed by fellow Liverpudlian Richard Abbey as engraver. Robinson probably brought Abbey copperplates to Staffordshire with him, but may well have continued to order new ones from him. The other side is printed with a landscape. Hibernia sits next to bales marked "Irish Manufactory", "for France", "For Spain" and "For America". 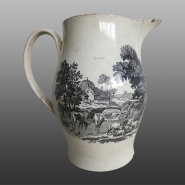 Creamware jug printed in black with Hibernia, the personification of Ireland, celebrating the relaxation of trade restrictions on Irish exports in 1780. Below her is the inscription "Ye Sons of Hibernia rejoice in the Freedom of your extensive COMMERCE" and two documents labelled "Reduction of the Pension List" and "Taxation of Non Residentials." She sits next to an Irish harp, a cap of Liberty on a pole, and bales marked "Irish Manufactory", "For France", "For Spain" and "For America".